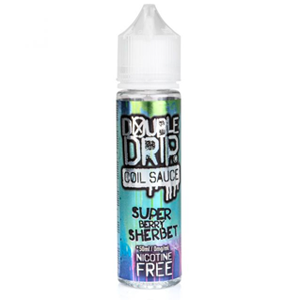 Find Double Drip's bestselling range of E-Liquids online at Vapestore. Made in the UK by industry-leading experts Vapour Labs, Double Drip is their popular range of maximum VG vape liquids designed for great clouds and amazing flavour. We like to ensure we're stocking the best vape liquids at Vapestore, and the Double Drip brand is one we vape and would happily recommend to you! Treat your taste buds with this raspberry and sherbet e-liquid! Vapouriz’s famous Double Drip coil sauce has received critical acclaim from industry experts and vapers alike for its high-octane, Max VG flavour. So relentlessly delicious, you’ll want to Double Drip again and again! Designed for serious clouds and amazing taste, Double Drip is perfect for any sub ohm vape setup. Try these vape liquids with the Vapouriz V-Switch for the best vape and liquid combination! When people think of Double Drip, the first thing that comes to mind is incomparable flavour. Those seeking a mind-blowing menthol flavour vape liquid will find themselves slowly but surely becoming hooked on Crystal Mist; a deliciously-icy blend of blue raspberry and decadent black cherries with a hint of cool, refreshing menthol. Fancy something a little sweeter? Then fill your vape tank with the tangy taste of Lemon Sherbet, where sweet, sharp lemon meets sparkling rainbow sherbet. Citrus flavour lovers can indulge even further in the decadent blend of Lemon Tart, which combines tangy lemons with warm pastry and lashings of fresh-whipped cream. Our sweetest and perhaps most iconic Double Drip vape liquid flavour is Strawberry Banana Waffle, which captures the oven-baked freshness of waffles topped with slices of sweet banana, succulent strawberries and a hint of warming vanilla. Much imitated but never matched – there is only one Strawberry Banana Waffle, and it bears the Vapouriz badge of honour! Shop the entire range at Vapestore online today, or find one of our shops new you, where you’ll find even more Double Drip flavours bursting from the bottle with uncontainable deliciousness! The Double Drip range is ideally paired with a sub ohm setup like the V-Switch, which is an excellent entry level vape kit for those looking to explore sub ohm vaping without having to deal with confusing settings or rebuildable elements. However, these juices work just as well with any of the kits from our sub ohm range such as the highly-portable Smok Baby Prince kit. The Baby Prince is compact and easy to operate, and features innovative mesh coils for impeccable flavour delivery. These coils really do justice to the multi-dimensional flavours in the Double Drip vape liquids, allowing you to taste every note with luscious clarity. We recently added a selection of new vape liquid flavours to our already outrageous Double Drip line, including Caramel Apple Cake, a deliciously-indulgent vanilla sponge layered with sweet oven-baked apples and lashings of rich caramel sauce. For something a tad more refreshing, Lemon Lime Tangerine Ice combines tangy lemons, zingy limes and sweet tangerines mellowed with a subtle ice-cool menthol kick. Sweet-lovers can hark back to simpler times of delving into paper bags filled with their favourite tuck shop treats with Sherbet Rainbow; a total treat for the palate which captures the taste of fizzy rainbow sherbet coated in a fruity hard candy exterior. Strawberry Laces & Sherbet provides a similarly-sweet sensation by bottling the taste of tangy strawberry laces sprinkled with sugary rainbow sherbet. The Double Drip range is available in 0, 3 and 6mg nicotine strengths in fully TPD-compliant 10ml bottles. The range is also available in 50ml shortfill bottles which don’t contain nicotine, allowing you to adjust the nicotine content to your exact preferences. By adding a 10ml nicotine shot to a 50ml shortfill bottle you will create 60ml of 3mg e-liquid. I love the sweet and fresh taste that Crystal Mist gives. The secret behind this tasty flavour is the perfect balance of raspberry and black cherry. And the icy blast on the inhale is out of this world! My favourite flavour is Sun Drip. I love the juiciness of all the fruits. It is very refreshing, with a sweet hit. I use it as one of my all day vapes. Also, I recommend LEMON LIME TANGERINE (amazing) ICE!